Since the normalization of China-Japan diplomatic ties, relations between the two countries have developed tremendously. But after the “collision incident” near the Diaoyu Islands amid Tokyo’s moves to “nationalize” the Diaoyu islands, relations between two countries fell off a cliff, resulting in cessation of official visits, a decline in trade relations and stagnant personnel exchange. Over the following years, relations between two countries slid to the worst period since the modern era. Thanks to strenuous work on both sides, Japanese Prime Minister Shinzo Abe demonstrated willingness to improve ties between two countries on many occasions in 2017 and showed a positive attitude towards the Belt and Road Initiative proposed by China. Later, Toshihiro Nikai, secretary general of Japan’s ruling Liberal Democratic Party, led a delegation to the Belt and Road Forum for International Cooperation, a significant boost for bilateral ties. Against this positive backdrop, Shinzo Abe’s visit is expected to play an important role in putting China-Japan relations back on track. Of course, whether the relations between the two countries can enjoy “sunshine after rain” remains foggy because some major issues remain unsettled. For starters, on the Diaoyu Islands, Japan even has not admitted their sovereignty is disputable, let alone any willingness to negotiate. China proposed “seeking joint development while shelving sovereignty” as a practical compromise. But the two countries still have not reached any consensus. Furthermore, the two countries have had occasional standoffs at sea in the region, which always risk severe damage to bilateral ties. Secondly, Japan’s strategy to deter China has not changed substantially but is quietly expanding instead. The country’s mainstream mentality still considers China’s rise an uncertainty for the Asia-Pacific and even the world and believes a strong China has the danger of becoming a “regional hegemony.” Japan is wary of its shifting position in the region. Thirdly, the Japanese government has maintained alignment with the U.S. in foreign diplomacy and the Abe administration is no exception. As the trade war between China and the U.S. escalates into all-out confrontation, it also poses a great challenge for Japan’s foreign diplomacy. Although Japan and China share considerable mutual interest in protecting multilateralism and the free trade system, it is unrealistic to expect Japan’s backing for China’s position on the issue given its rote alliance with the U.S. Nevertheless, Abe’s visit demonstrates a move in the right direction to salvage bilateral relations although fundamental improvement still requires painstaking efforts from both sides. China first proposed the Belt and Road Initiative five years ago. Japan’s reaction towards the Initiative has shifted from negative coping to positive willing. This is an encouraging sign. Since 2017, Japan has frequently showed willingness to discuss cooperation within the initiative, and Abe personally expressed interest to cooperate in big ways. As a result, China and Japan have reached consensus on developing third party markets. During Abe’s visit this year, the two sides will hold a forum on cooperation over this issue, which signals consensus is becoming action. Both sides are to establish a new platform for future practical and efficient cooperation. But not everyone in Japan is excited about cooperation with China within the Belt and Road Initiative. Some believe the initiative is not just a concept for economic cooperation but a geopolitical strategy. Some have even argued for strengthening the “Indo-Pacific strategy” and “Freedom Corridor” to balance China’s Belt and Road Initiative. Such a move would prove counter-productive considering the potential economic losses from a decline in China-Japan relations. Although China and Japan still have a handful of disagreements, these should not hinder the arrival of a new phase of China-Japan relations. Times are changing, and the international situation is evolving. As the second and third largest economies in the world, China and Japan face unprecedented domestic and international situations. Against a backdrop sated with complication and uncertainty, China and Japan should approach challenges together and jointly shoulder responsibilities to promote a global governance system progressing towards greater fairness and justice. 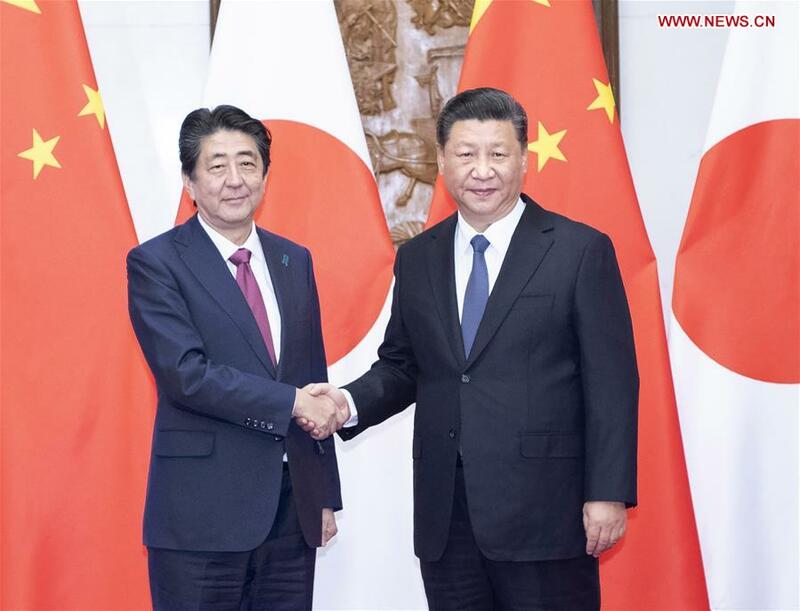 From a wide perspective, stable and sound development of China-Japan relations conforms to the fundamental interest of both sides. While controlling divergences efficiently, they need to jointly tap cooperative potential, allow practical cooperation serve as the booster for bilateral relations and cooperation in third party markets within the framework of Belt and Road. Meanwhile, China and Japan should work to facilitate cooperative progress throughout China, Japan and South Korea, form the Regional Comprehensive Economic Partnership (RCEP), promote integration and foster regional cooperation. In a global context of rising unilateralism and protectionism, China and Japan should maintain a global view and march forward hand-in-hand to protect multilateralism and free trade systems to contribute to the stable advancement of world economy. The author is a researcher at the China Institute of International Studies.